Today was supposed to be a whirlwind day of church and then a bike ride in Santa Cruz, but I have a big project at work that is going out the door tomorrow so we ended up canceling all of it in favor of making sure I had time to do everything well without being super stressed. CJ was tired anyway, and the kid thought nudism was the word of the day, so it's just as well we only left the house to grocery shop. 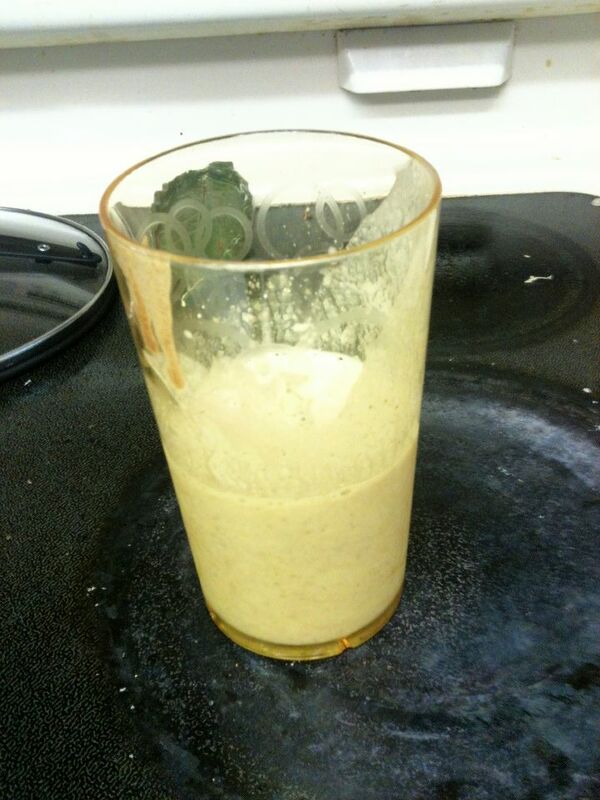 In the morning I made myself a Nut Butter Smoothie with almond butter. The kid was jealous and didn't want her yogurt--next time I'll have to make a double batch. It isn't very photogenic, though. I bought a bag of overripe bananas at a discount last weekend and they had just gotten to the "make bread" point today, so I also made a loaf of banana bread and then froze the rest of the bananas (halved and peeled) for later use in smoothies or baking. I had the end slice when it was piping hot, and it was great on its own. 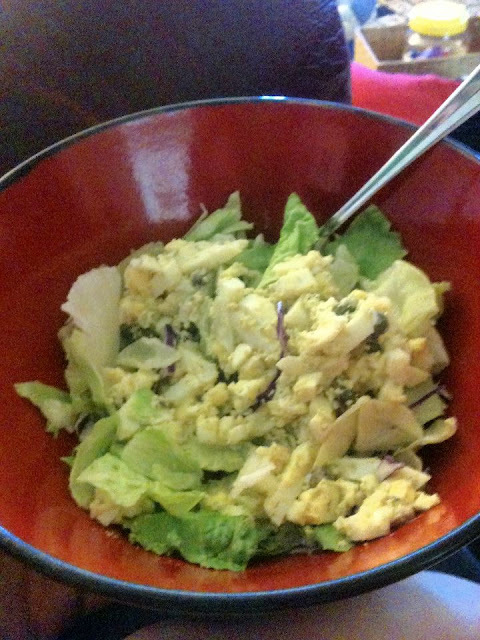 I didn't get lunch until late, but I made up for lost time by making a yummy egg salad. No mayo or relish--this was the fancy stuff! = P I ate it over salad greens as is my usual practice these days. 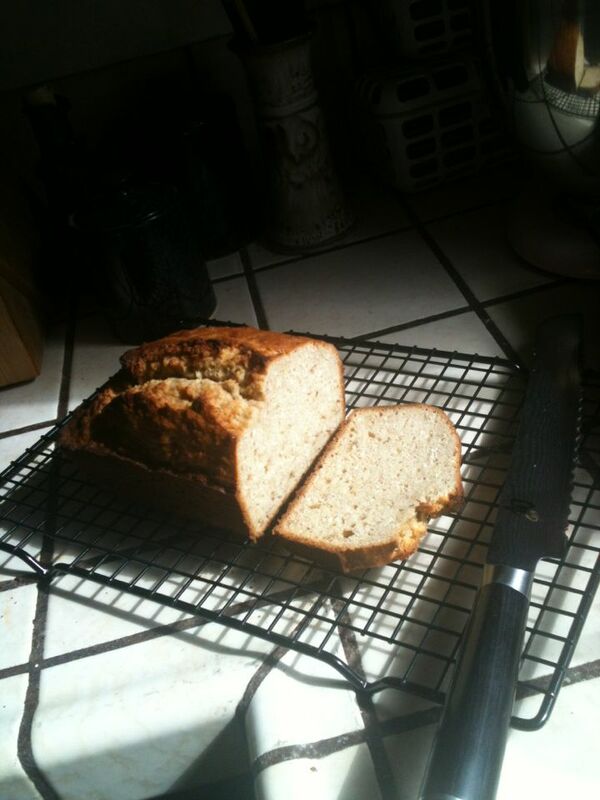 Another slice of that banana bread served as a sweet snack. I decided we should have a light dinner after our late lunch, so I grabbed some organic creamy tomato soup while at the grocery store and added a salad of baby lettuces, avocado, cucumber, and turkey breast with a yogurt/blue cheese dressing. I forgot to take a picture, but I packed the same thing for my lunch tomorrow so I'll snap one then! Combine all ingredients in a blender or in a cup using an immersion blender. Preheat oven to 350 degrees F. Grease a standard loaf pan. Combine dry ingredients well. Cream butter and mix in eggs and banana until well-combined. Add wet ingredients to dry, and stir until just combined. Gently mix in coconut, nuts, and vanilla. Pour into loaf pan and bake for 45 minutes to an hour, until the top is brown and a pick comes out almost clean. This will be moister than most breads. Peel and dice the boiled eggs. Add everything except the olive oil, then add olive oil until the eggs are moist enough for your taste. Other things to throw in if you have & like them: sundried tomatoes, fresh fennel root (diced small), olives, other fresh herbs.